The Hariyo Ban project—which is named after the Nepali saying “Hariyo Ban Nepal ko Dhan” meaning “healthy green forests are the wealth of Nepal”—is a five-year initiative (2011-2016) that aims to reduce the adverse impacts of climate change and threats to biodiversity in Nepal. 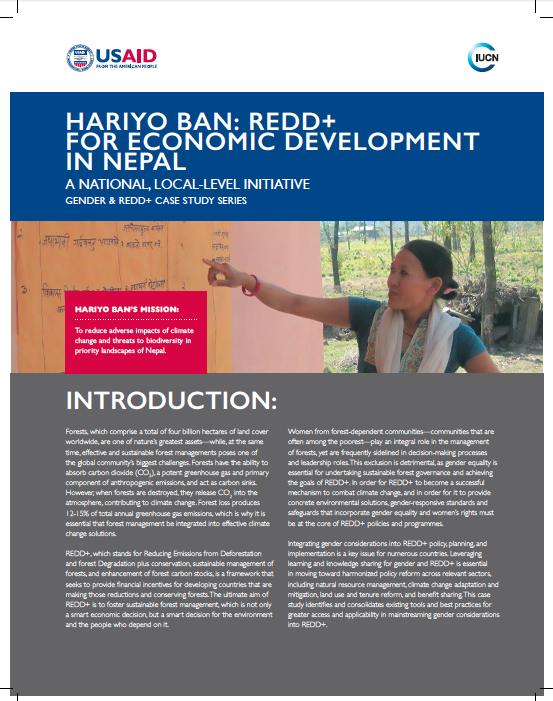 Beginning in 2011 and funded by the United States Agency for International Development (USAID), Hariyo Ban is designed to reduce threats to the country’s vast physical and biological diversity, build resilience to climate change in communities and ecosystems, and improve the livelihoods of Nepal’s most impoverished communities by emphasizing the links between people and forests. The project intends to ensure meaningful engagement of women and socially excluded groups in REDD+ initiatives by building their knowledge and capacity, as well as increasing gender-responsive REDD+ policy design. Hariyo Ban supports the broader conservation and development objectives and strategies of the Government of Nepal and works closely with the government in program implementation. Additionally, by working with Nepal’s communities, civil society, private sector, academia and media, the program endeavors to empower locals in safeguarding the country’s living heritage and adapting to climate change through sound conservation and livelihood approaches.